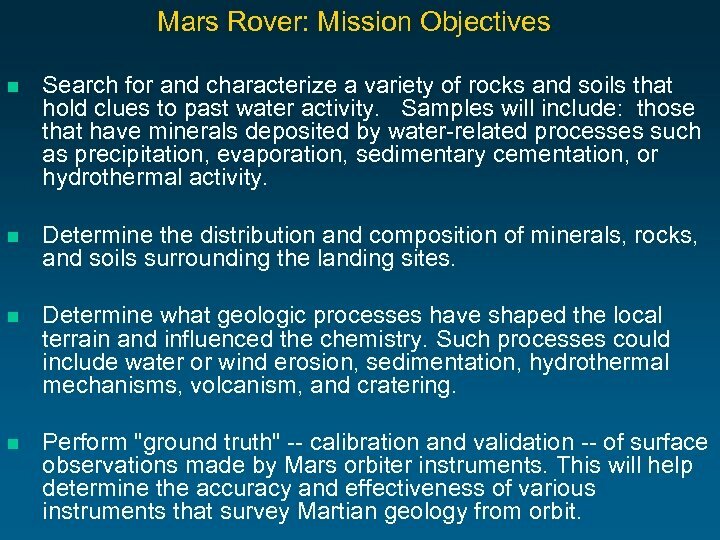 Mars Rover: Mission Objectives n Search for and characterize a variety of rocks and soils that hold clues to past water activity. Samples will include: those that have minerals deposited by water-related processes such as precipitation, evaporation, sedimentary cementation, or hydrothermal activity. n Determine the distribution and composition of minerals, rocks, and soils surrounding the landing sites. n Determine what geologic processes have shaped the local terrain and influenced the chemistry. 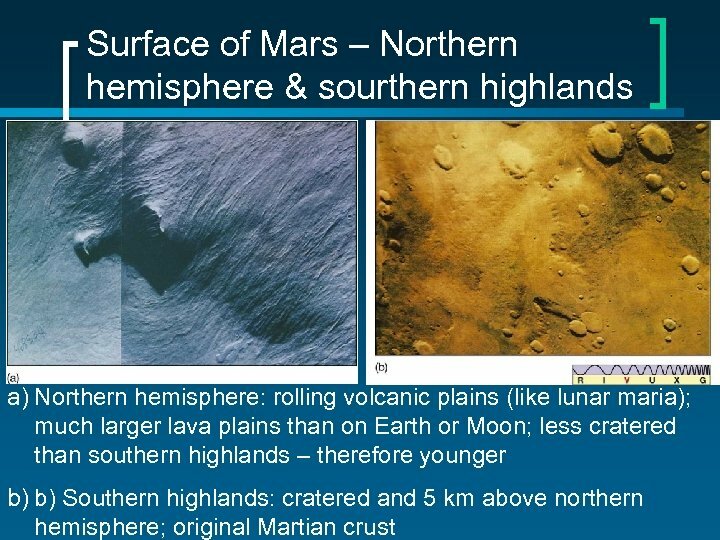 Such processes could include water or wind erosion, sedimentation, hydrothermal mechanisms, volcanism, and cratering. 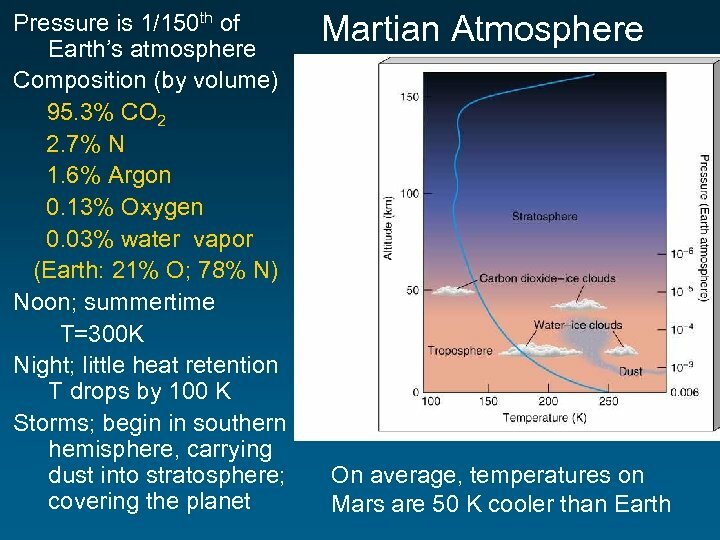 n Perform "ground truth" -- calibration and validation -- of surface observations made by Mars orbiter instruments. 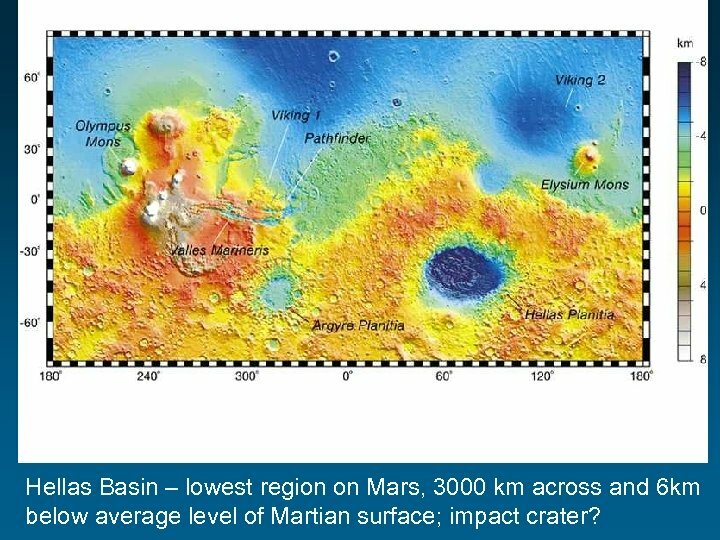 This will help determine the accuracy and effectiveness of various instruments that survey Martian geology from orbit. 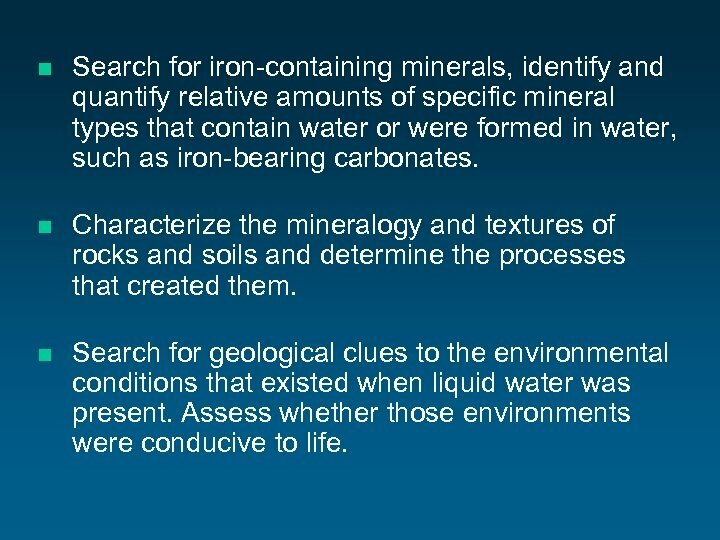 n Search for iron-containing minerals, identify and quantify relative amounts of specific mineral types that contain water or were formed in water, such as iron-bearing carbonates. n Characterize the mineralogy and textures of rocks and soils and determine the processes that created them. n Search for geological clues to the environmental conditions that existed when liquid water was present. 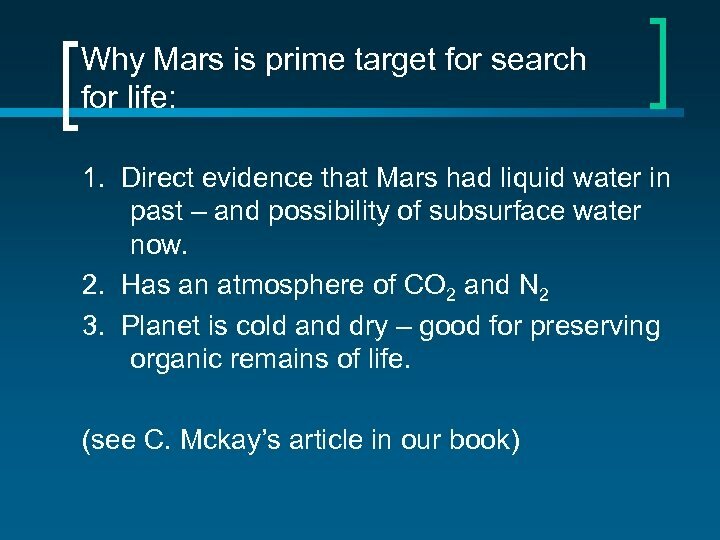 Assess whether those environments were conducive to life. 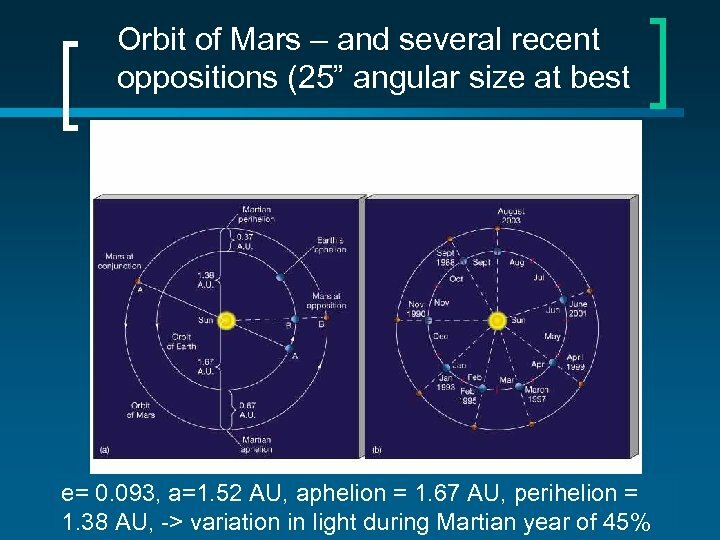 Mars/Earth Comparison: n Mean Distance from Sun: 1. 52 AU 1 AU n Average Surface Pressure: 0. 5 – 1 k. Pa 101. 3 k. Pa n Diameter: 4, 220 miles 7, 926 miles n Tilt of Axis: 25 degrees 23. 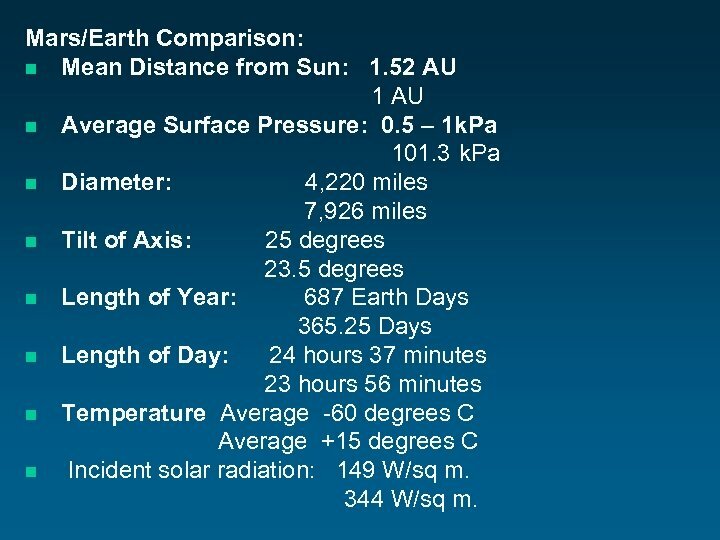 5 degrees n Length of Year: 687 Earth Days 365. 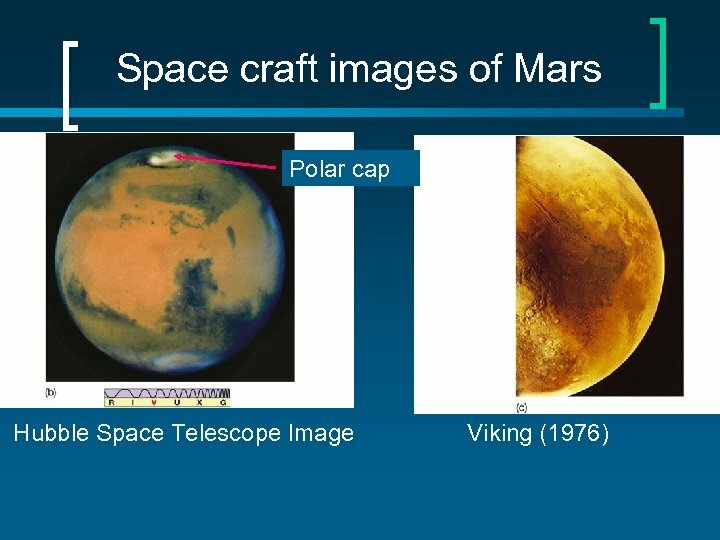 25 Days n Length of Day: 24 hours 37 minutes 23 hours 56 minutes n Temperature Average -60 degrees C Average +15 degrees C n Incident solar radiation: 149 W/sq m. 344 W/sq m.
Hellas Basin – lowest region on Mars, 3000 km across and 6 km below average level of Martian surface; impact crater? 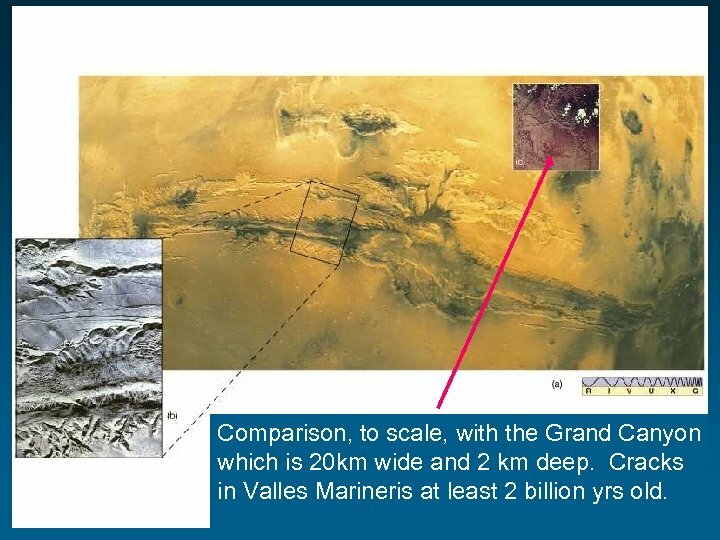 Comparison, to scale, with the Grand Canyon which is 20 km wide and 2 km deep. 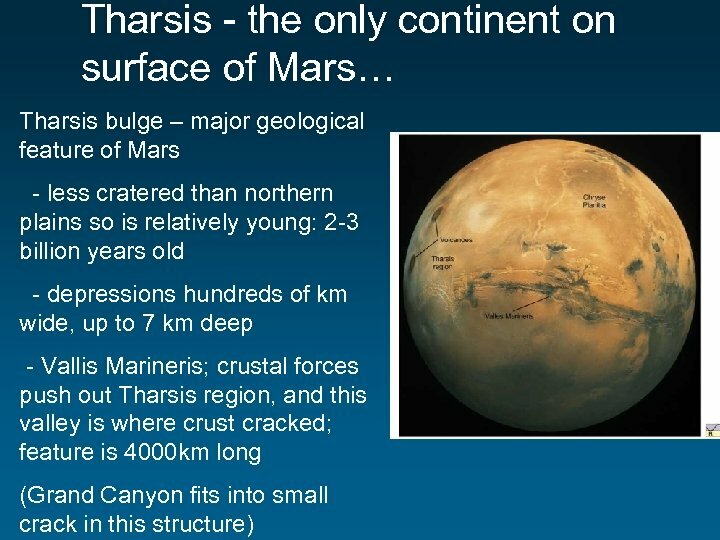 Cracks in Valles Marineris at least 2 billion yrs old. 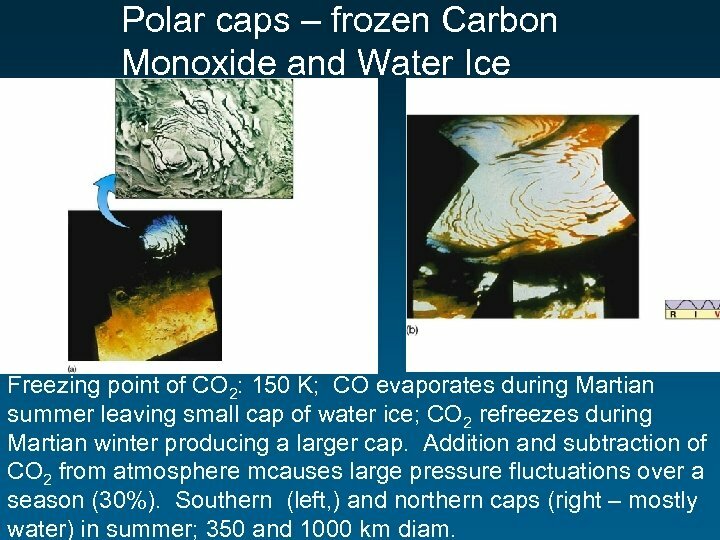 Polar caps – frozen Carbon Monoxide and Water Ice Freezing point of CO 2: 150 K; CO evaporates during Martian summer leaving small cap of water ice; CO 2 refreezes during Martian winter producing a larger cap. Addition and subtraction of CO 2 from atmosphere mcauses large pressure fluctuations over a season (30%). Southern (left, ) and northern caps (right – mostly water) in summer; 350 and 1000 km diam. 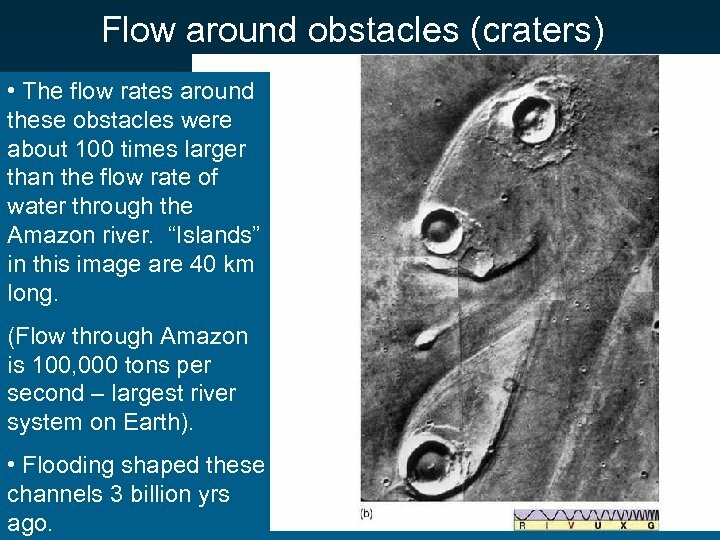 Flow around obstacles (craters) • The flow rates around these obstacles were about 100 times larger than the flow rate of water through the Amazon river. “Islands” in this image are 40 km long. (Flow through Amazon is 100, 000 tons per second – largest river system on Earth). 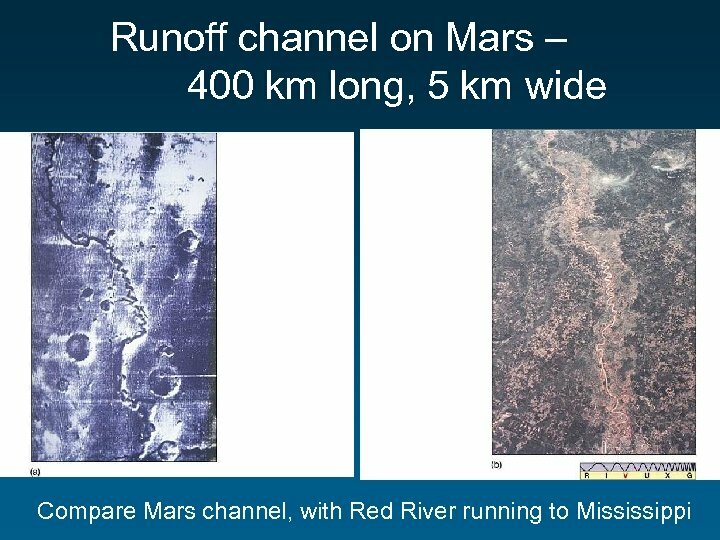 • Flooding shaped these channels 3 billion yrs ago. Where did all the water go? 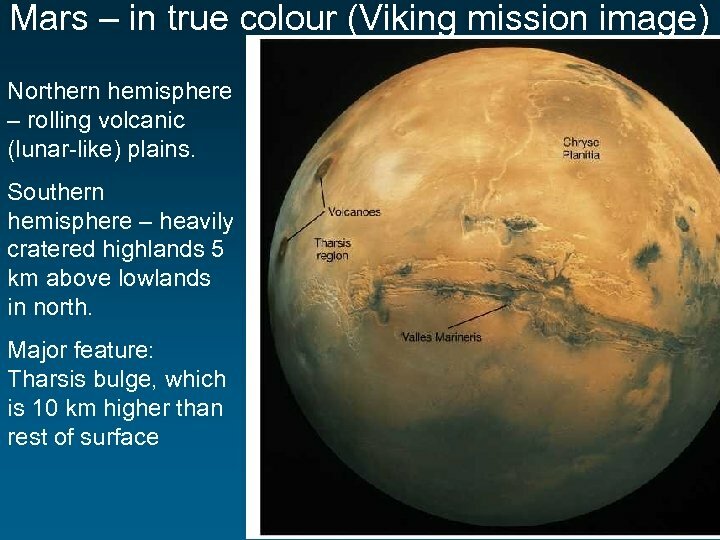 n n Mars had rivers, lakes, and possibly oceans. 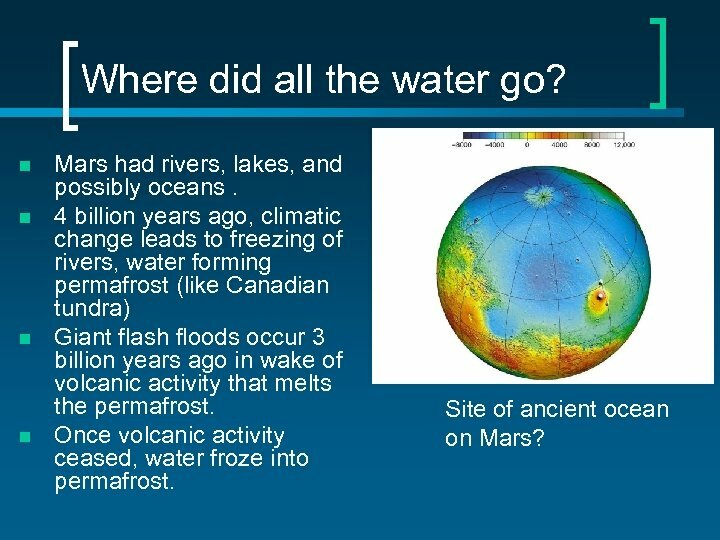 4 billion years ago, climatic change leads to freezing of rivers, water forming permafrost (like Canadian tundra) Giant flash floods occur 3 billion years ago in wake of volcanic activity that melts the permafrost. Once volcanic activity ceased, water froze into permafrost. 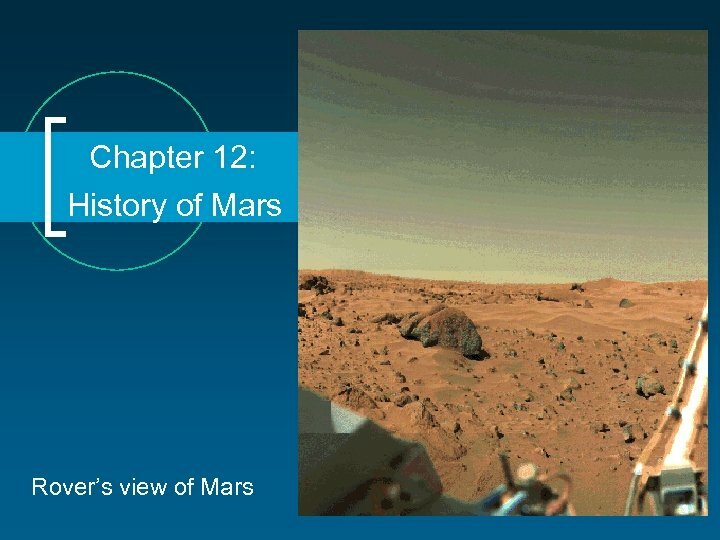 Site of ancient ocean on Mars? How much water was/is there? 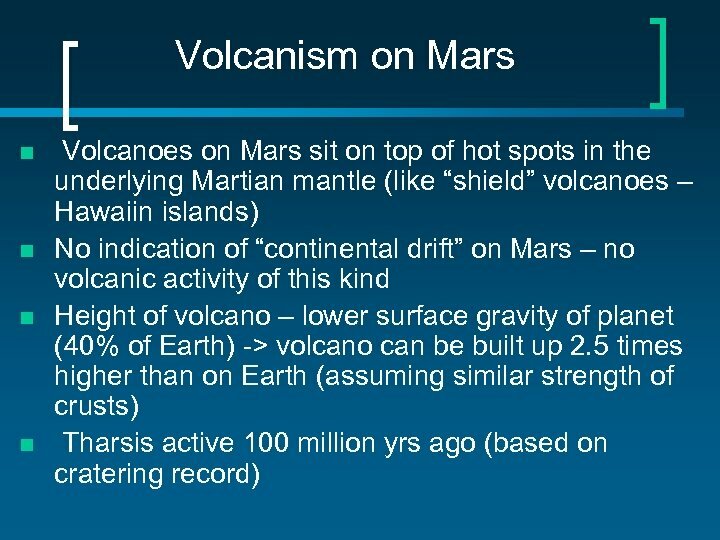 n n To explain existing erosional features; need 0. 001 – 0. 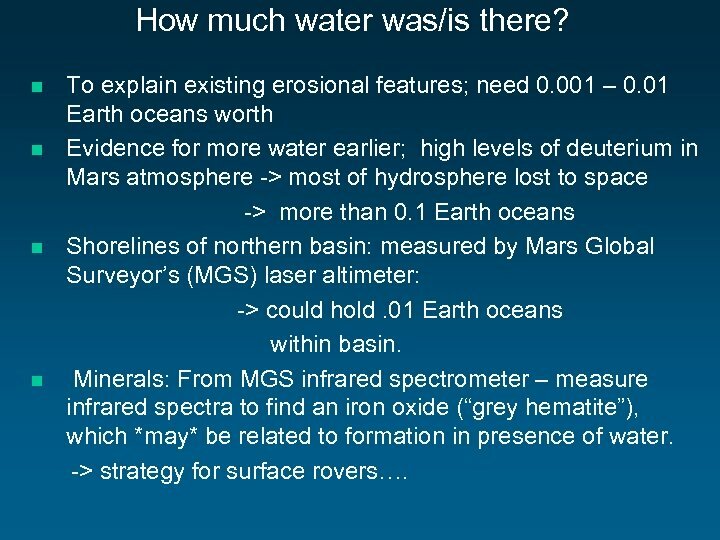 01 Earth oceans worth Evidence for more water earlier; high levels of deuterium in Mars atmosphere -> most of hydrosphere lost to space -> more than 0. 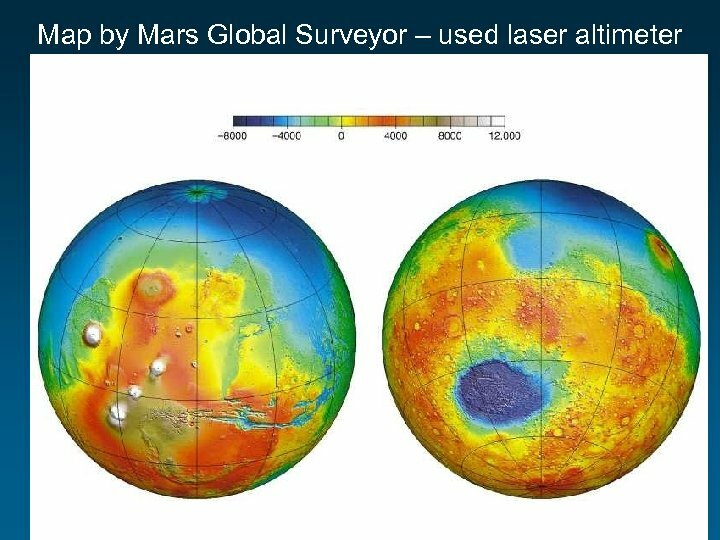 1 Earth oceans Shorelines of northern basin: measured by Mars Global Surveyor’s (MGS) laser altimeter: -> could hold. 01 Earth oceans within basin. Minerals: From MGS infrared spectrometer – measure infrared spectra to find an iron oxide (“grey hematite”), which *may* be related to formation in presence of water. 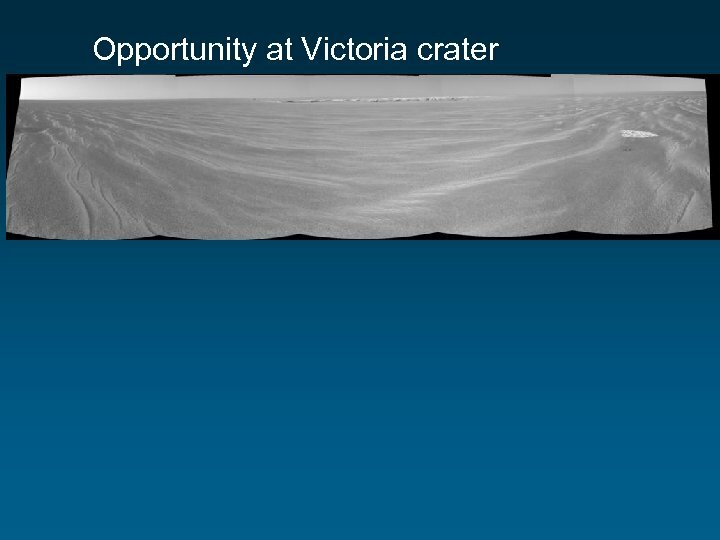 -> strategy for surface rovers…. 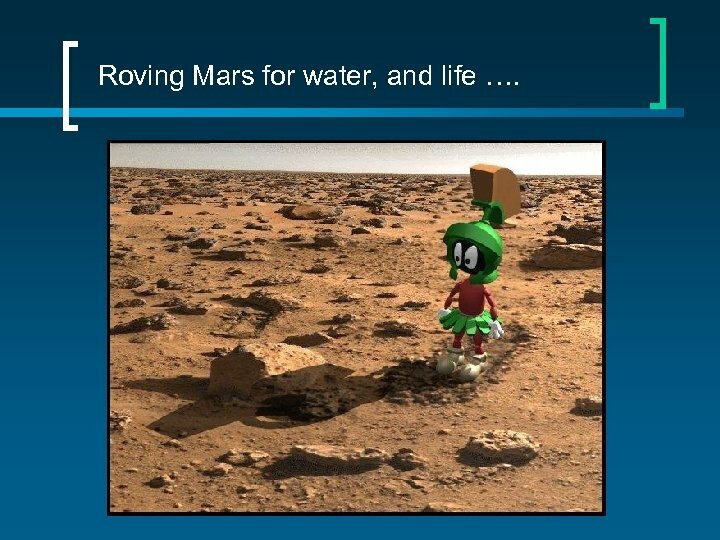 Roving Mars for water, and life …. n Gas Chromatograph Mass Spectrometer (GCMS): - no detection of organics in soil to one part per billion. 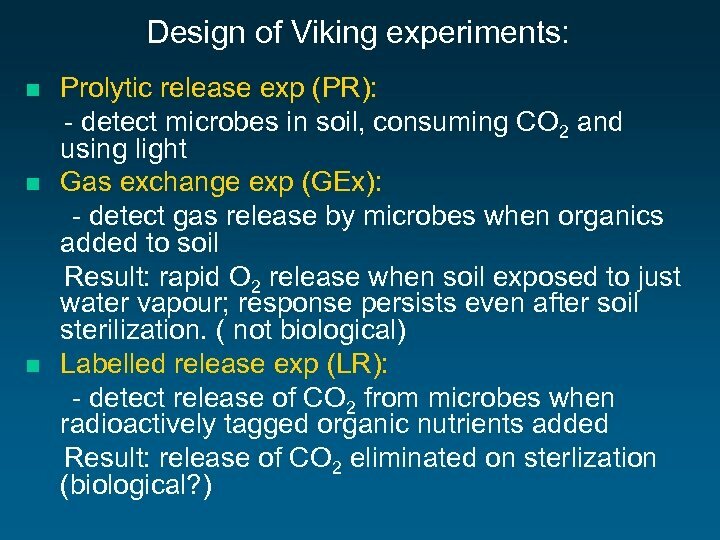 - major reason why results of exps interpreted as due to reactivity of martion soil. Why? 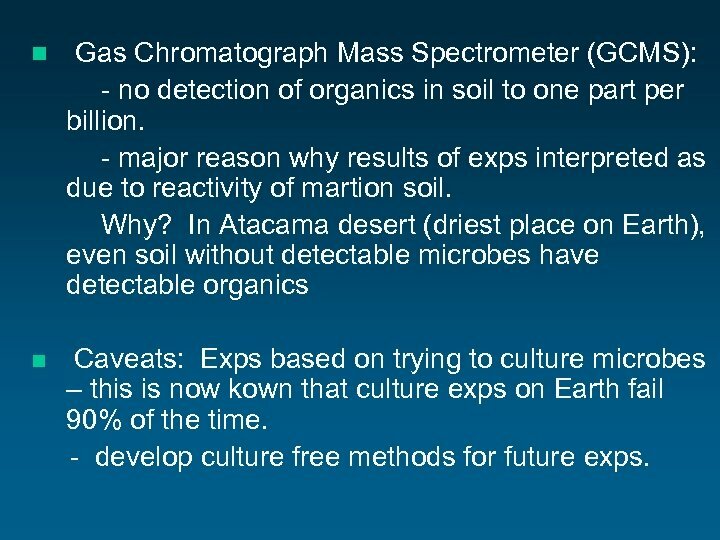 In Atacama desert (driest place on Earth), even soil without detectable microbes have detectable organics n Caveats: Exps based on trying to culture microbes – this is now kown that culture exps on Earth fail 90% of the time. - develop culture free methods for future exps. 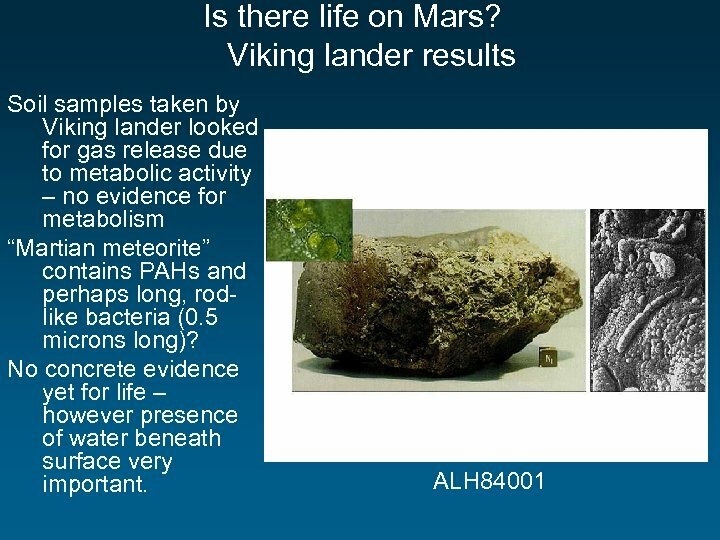 Rovers: Physical evidence for water; spherules seen in Eagle Crater rock outcrop site. Not volcanic… but gypsum (most common sulfate mineral) crystals. Fell out of sedimentary rock perhaps due to wind erosion. 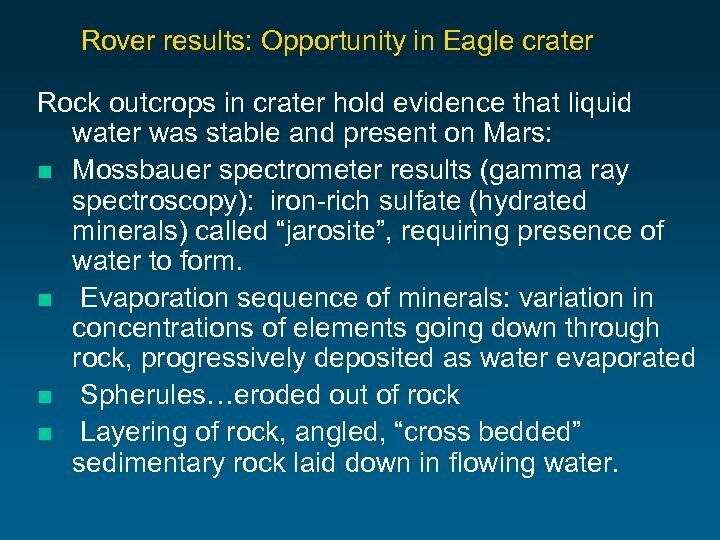 Rover results: Opportunity in Eagle crater Rock outcrops in crater hold evidence that liquid water was stable and present on Mars: n Mossbauer spectrometer results (gamma ray spectroscopy): iron-rich sulfate (hydrated minerals) called “jarosite”, requiring presence of water to form. 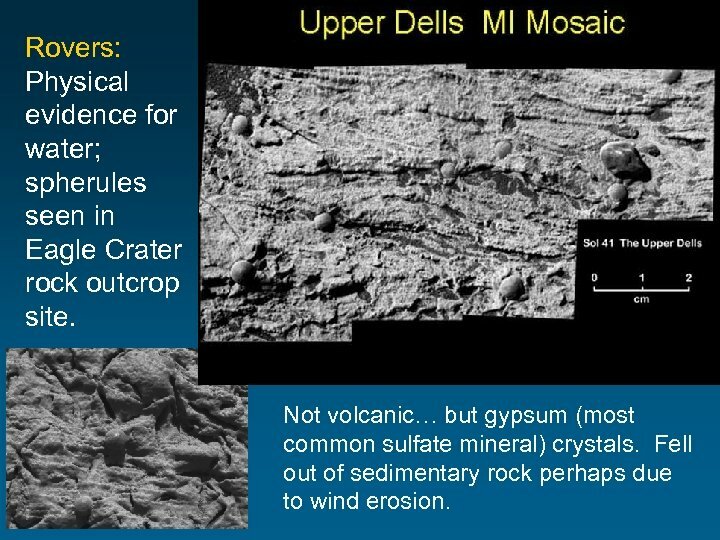 n Evaporation sequence of minerals: variation in concentrations of elements going down through rock, progressively deposited as water evaporated n Spherules…eroded out of rock n Layering of rock, angled, “cross bedded” sedimentary rock laid down in flowing water. 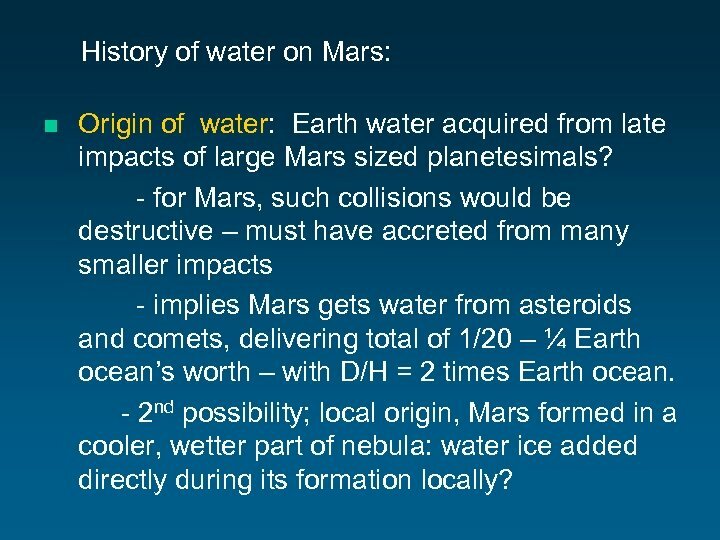 History of water on Mars: n Origin of water: Earth water acquired from late impacts of large Mars sized planetesimals? 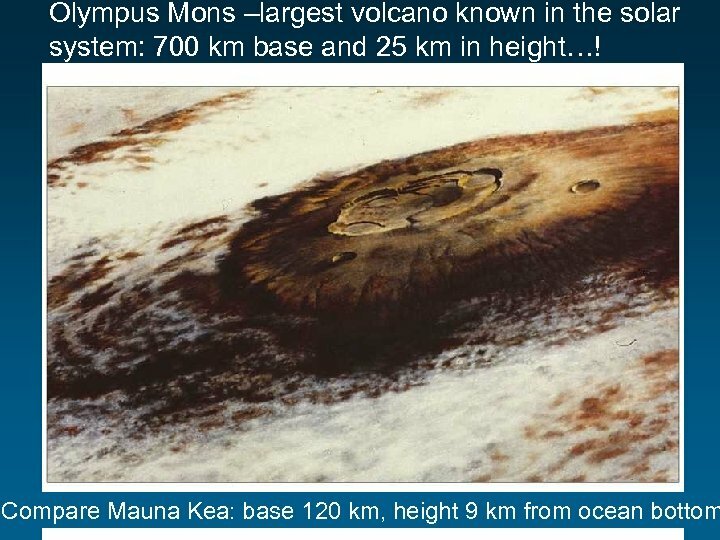 - for Mars, such collisions would be destructive – must have accreted from many smaller impacts - implies Mars gets water from asteroids and comets, delivering total of 1/20 – ¼ Earth ocean’s worth – with D/H = 2 times Earth ocean. 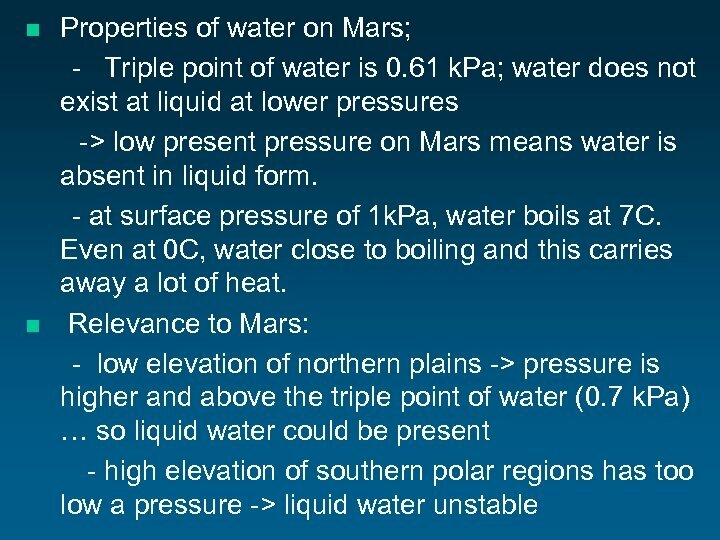 - 2 nd possibility; local origin, Mars formed in a cooler, wetter part of nebula: water ice added directly during its formation locally? 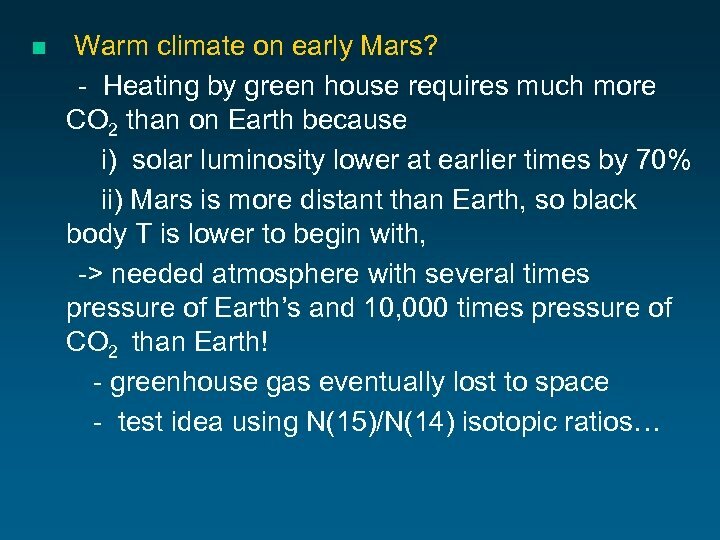 n Drying and freezing of Mars: - High erosion rates on early Mars due to warm and wet surface conditions - eg. 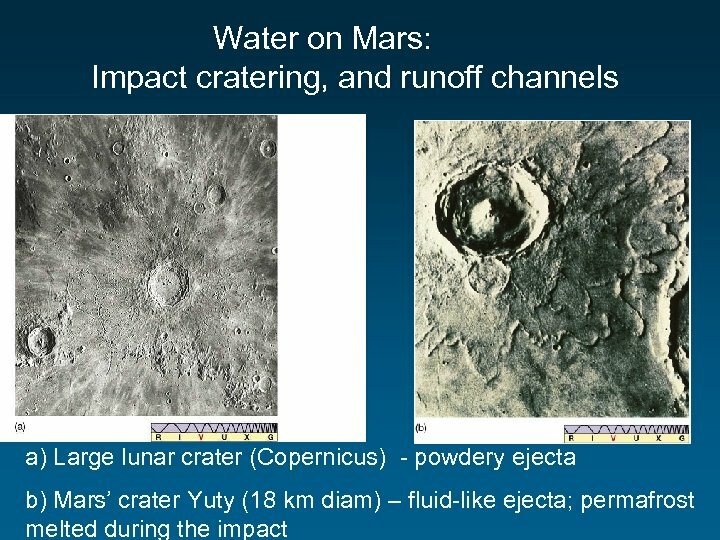 heavy erosion of large impact craters in older southern hemisphere material - on younger terrains, much less erosion (possibly by several thousand times) -> early and quick end to wet era. 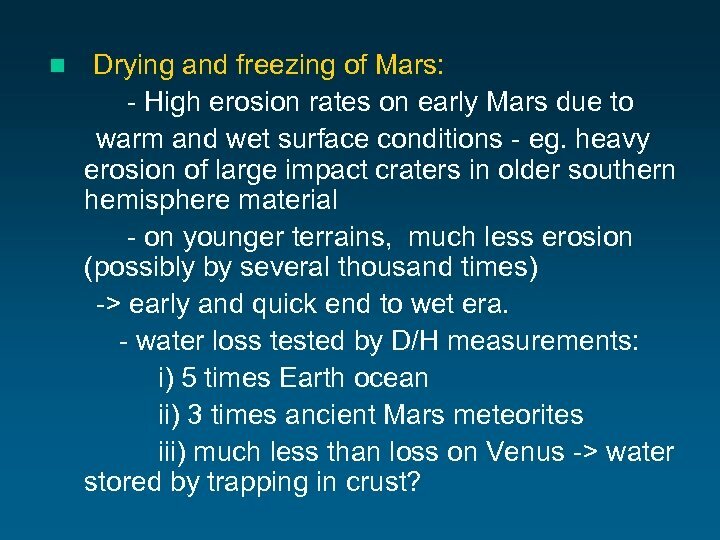 - water loss tested by D/H measurements: i) 5 times Earth ocean ii) 3 times ancient Mars meteorites iii) much less than loss on Venus -> water stored by trapping in crust?